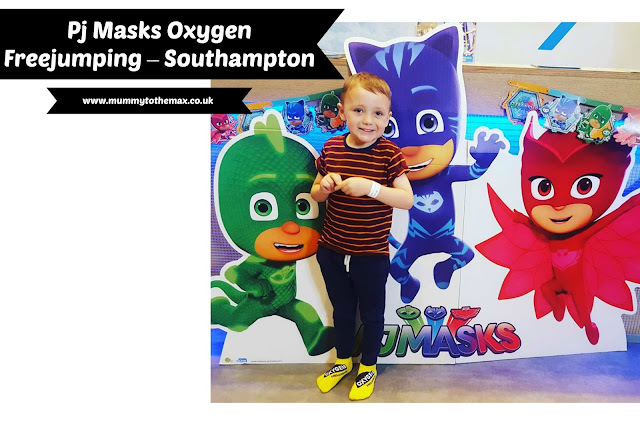 A few weeks ago Maxwell, Ben and I were invited to Oxygen Freejumping in Southampton. We were invited to join the PJ Masks "Jumping Adventure"which is an early morning session held on each day of the week. 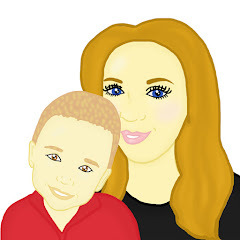 The sessions are perfect for children aged 5 years and under. Previously we had only ever been to Oxygen once for one of Maxwell's friends Birthday parties, so we were excited to see what the Pj Mask sessions were like. For anyone who is not aware of Oxygen, Oxygen is a large trampoline park. As soon as we arrived at the venue, we were greeted by the friendly team that worked there. We got our tickets and went on to purchase our socks which everyone needs to have to jump at the trampoline park. Priced at £2, I think the price is reasonable. The socks are something you can reuse if you decide to visit Oxygen again so although they are an initial cost, they are a item which you do not have to keep buying on every visit. Once we were ready to head into the trampoline park, we placed our valuables into a locker and headed into a room to watch a safety video. Once we had watched the safety video, we were allowed to go into the trampoline park. We were told that the PJ Masks "Jumping Adventure" hour sessions were split into separate segments that would flow with the Pj Masks characters interests. Over the course of the hour we performed Catboy’s, Owlette’s, and Gekko’s super skills and abilities as well as mastered some of our own skills. Throughout our hour session, staff kept us engaged and showed us what they expected of us through each segment. If the children decided they would rather have fun doing something else in the trampoline park, this was also not a problem. All the children and adults were encouraged to have fun. 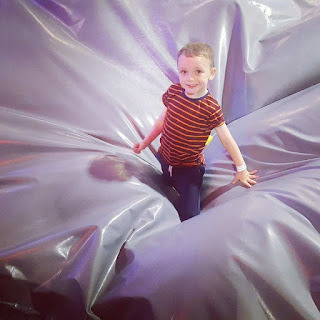 One of Maxwell's favourite things to do was to jump on a huge air bag. Maxwell did not grow tired of running on a trampoline and bouncing off it onto the air bag. This was a huge highlight of Maxwell's tip. Maxwell also loved playing dodge ball with us. As a family, we loved playing piggy in the middle and we loved playing games and passing the ball to one another. As a family we had great fun. We felt that the session went too fast for our liking and we would have loved a little more time to have fun in the trampoline park. As a parent, I loved the age range that attended the PJ mask sessions. 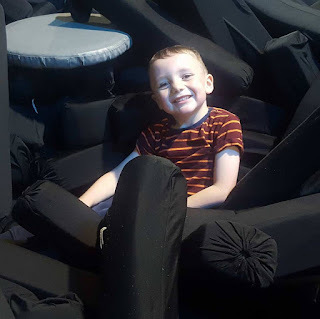 Due to everyone being 5 or under, there was not a chance of Maxwell getting squashed by any older children wanting to have lots of fun. We loved that the activity kept us all moving and we loved that we all managed to exercise in one of the funniest ways possible. PJ Masks ‘Jumping Adventures’ sessions are the same price as the regular Little O toddler sessions which can be attended by under 5's in term time. Priced at just £5 for both adults and children, I think these sessions are affordable for many. *We received free entry into Oxygen - Southampton for the purpose of this post. All thoughts and opinions are of my own.